If you'd like to see my punk picks from the Met Gala last night, please kindly visit my Facebook page. I choose those who I thought truly embraced the punk theme, minus Madonna who was close but threw me with the thigh-highs. Non-ripped opaque thigh highs are too heavy metal to make my punk rock list. Madonna with Riccardo Tisci at last night's Met Gala. Instead of watching the Met Gala livestream, I was in bed by 8pm trying to get my girl to sleep while wondering "What do I want to do for Mother's Day?" Get a mani-pedi, go to the park, enjoy breakfast in bed? On my second Mother's Day, my husband let me sleep in and he took my daughter out for a long walk. About ten minutes after they left, I could hear a child screaming down the block, and my first thought was "I'm spending Mother's Day in the ER." Luckily, it was just a scary bad fall, no stitches needed. But yeah, I wasn't going back to bed after that! 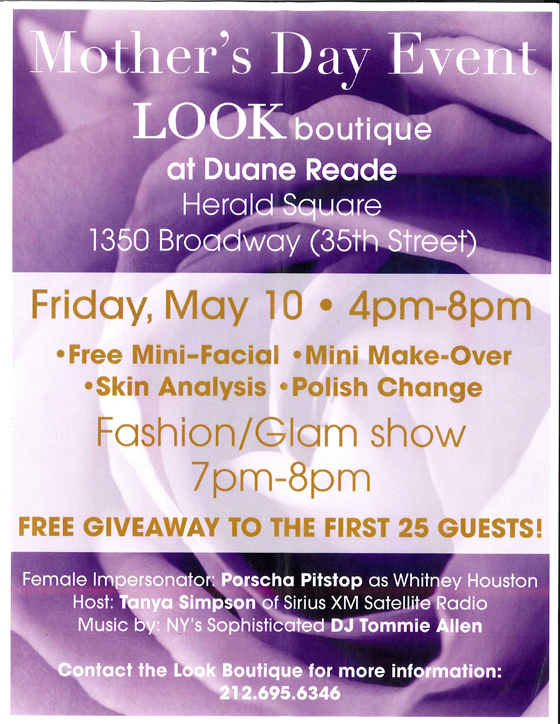 Duane Reade Herald Square has something special in store for moms this Friday, May 10th, and I love how they're thinking: free mini-facial, mini makeover, polish change, and more. Also, there will be a female impersonator (it's not really a Mother's Day party without one) and a fashion/glam show. Click on the flier above for more details, or call the Look Boutique for more information. From all the moms out there, thanks for thinking of us, Duane Reade.